Without fracking, drilling, stripmining, or pipelining. The document, released by the Department of the Interior and the Department of Energy, is the culmination of two years of dialogue between regulators, environmentalists, industry advocates and the public at large. On Tuesday, the DOI unveiled the much-awaited Final Programmatic Environmental Impact Statement (PEIS), which sets a vision for development on public lands in six Western states — Arizona, California, Colorado, Nevada, New Mexico and Utah. The Interior has approved 17 zones for utility-scale solar energy projects on about 285,000 acres of public land with combined resources of nearly 32,000 megawatts (MW). It also sets up a process to allow development of what the DOI calls “well-sited projects” on 19 million acres outside those zones. PEIS estimates that the zones and the variance areas will eventually lead to about 23,700 MW of development. The plan is being well-received by environmental groups and local stakeholders. Leading environmental and solar industry groups issued a press release endorsing the plan, including Natural Resources Defense Council (NRDC), Audubon Society, Defenders of Wildlife, Sierra Club, The Wilderness Society, Solar Energy Industries Association, Southern California Edison, Vote Solar, First Solar, and Brightsource Solar. U.S. public lands are our Commons. Deciding how to use, maintain and preserve our country’s resources is a shared responsibility among all of us. So is NJ solar in better shape now, or not? On July 23, Governor Christie signed a solar-saving bill that will prop up New Jersey’s solar industry. It took a lot longer than expected, but a much-debated bill to maintain and potentially enhance New Jersey’s efforts to develop solar energy in the state was signed into law yesterday by Gov. Chris Christie. The bill (S-1925), a priority of the Christie administration with bipartisan support in the Legislature for more than six months, aims to ensure investments in solar do not dry up in New Jersey, which is second only to California in the number of solar arrays –with 16,000 systems installed here. But in the same breath, the Christie administration announced plans to slash the funds that help businesses and NJ homeowners buy into the solar market. The state is considering cutting its funding for new energy efficiency and renewable energy projects almost in half, a consequence of the Legislature’s and Christie administration’s decision to divert hundreds of millions of dollars from New Jersey’s clean energy program. In a draft proposal circulated by the New Jersey Board of Public Utilities last week, the budget for the clean energy program would allocate $339 million in new spending, a sharp reduction from the $651 million proposed by the agency last December. The cuts are a result of the diversion of money raised from gas and electric customers to help homeowners and businesses find ways to reduce their energy use, and promote the development of cleaner sources of producing electricity, primarily solar and wind. 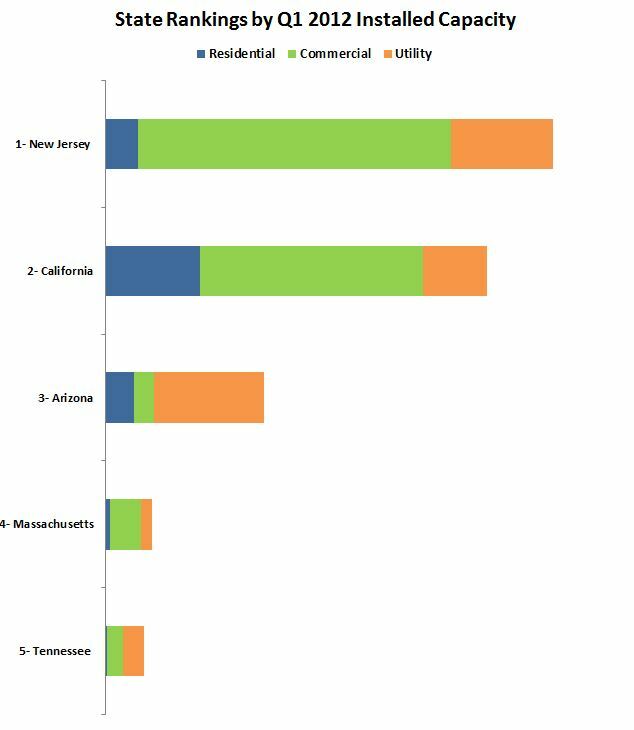 The clean energy fund has helped propel New Jersey to be a leader in promoting clean energy, a status underscored by the fact that is second only to California in the number of solar installations. The cuts aren’t certain. Michael Winka, director of NJ’s Clean Energy Program is requesting stakeholders and citizen comments on the proposal. I expect he’ll be getting a lot of mail in coming weeks. So what are we to make of this? Amid feverish Trenton negotiations that the solar sky is falling, NJ’s first-quarter 2012 solar installation numbers look great. As usual, Tom Johnson does a stellar job of framing the issues and laying out competing stakeholder viewpoints. More than 18,000 solar systems came on line in the first three months of the year, the report said, or a total of 506 megawatts in the U.S. It marked the second highest quarter ever in the U.S., according to the study. 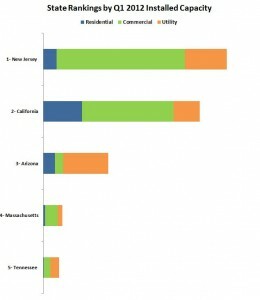 New Jersey installed a total of 174 megawatts of solar systems in the first quarter of 2012, or nearly one-third of the total arrays put in across the country, according to the U.S. Solar Market Insight, a publication put out by the Solar Energy Industries Association, an industry trade group. All right then, so how does this party square with plummeting SREC prices? One, the 1Q2012 installs represent the fulfillment of 2011 orders and long-term contracts. Costs to install solar continue to drop, falling by an overall average of 17.2 percent nationwide, although solar executives said the decline in New Jersey is more in the range of 30 percent because of the intense competition here. Demand is driving innovation, which should be music to the ears of legislators on both sides of the aisle. Pony up for a stable, strong solar sector in NJ. That’s essentially the gist of the conversation in Trenton right now. It’s pretty clear that the sector will collapse without financial support from taxpayers. The question is, how much? And will that cost be worth it? Proponents say it’s a worthwhile tradeoff, noting solar energy has the promise of meeting a reasonable balance of environmental, reliability and economic objectives. The Governor is aligned with major industry players who say that supporting solar subsidies is the right move now. Pay a little bit now, get a lot of jobs and future revenues later. Opponents claim that it’s time to stop propping up solar and let market forces (aka “survival of the fittest”) decide. I’d be down with the let-the-market-decide if it were a level playing field. Oil enjoys tremendous government subsidies. The thing is, we’ve all gotten so used to it that we forget to account for it in the math. Here’s a nifty infographic on what oil and solar would look like with comparable support. What if Solar Power Had Fossil-Fuel like Subsidies? Governor Christie knows that too many people have skin in the solar sector to let it go down. For once, I’m in agreement. New Jersey’s newest solar farm is located on a 13-acre closed landfill in Kearny. From fallow to flourishing, the site is expected to power 500 homes. A key success here in my mind–and hopefully a model for future development–is that this project required a lot of people with their own agendas and motivations to work together. It could not have been easy to coordinate this first-in-class project between a state-regulated public utility (PSE&G), a joint government/business commission, private industry, and state government officials. Public Service Electric & Gas and others yesterday dedicated a new 3-megawatt solar farm on 13 acres of the former landfill, producing enough electricity to power up to 500 homes. The $17.8 million solar farm project, a joint effort between PSE&G, the Hackensack Meadowlands Development Commission, and SunDurance Energy, an Edison-based solar developer, is the first solar project built on a state-owned landfill. Mr. Johnson, thank you for an informative article and a headline that made me smile. NJ’s Franklin Township public officials are grappling with a proposed 20-megawatt solar-power “farm” on nearly 100 acres of privately held property currently zoned as farmland. New Jersey’s Farmland Assessment Act grants property owners lower tax assessments for farming or otherwise productively using their land. The law allows for up to 10 acres to be covered with solar panels. Since this proposal is for 10 times that limit, the owner would necessarily relinquish the farmland assessment to get into a new kind of farming. Is this a good move for the township? What are the risks and benefits of losing 100 acres of open space relative to this project’s clean energy generation potential? Will the land owner be permitted to build this project? Stay tuned for the discussions this project will raise around land use, renewable energy, and private property rights in NJ, the Crowded State. Public hearings are scheduled for late March.